Mark Reynolds founded Hable after leaving Microsoft, with a vision to use his experience in technology to help people do amazing things. In keeping with this, we’re proud to announce that Hable are partnering with Lionheart in support of Glad’s House in Kenya. 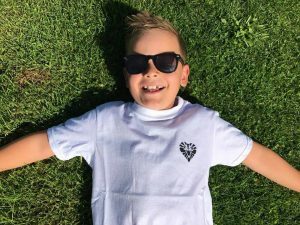 Mark’s son Leo was intrigued at the idea of starting a company so last year, aged 7, he set up his very own T-shirt business called Lionheart Clothing. When a child from the UK buys a t-shirt they become a member of #LeosLions and a T-shirt is donated to a street child in Mombasa, Kenya. The charity that Lionheart donate the T-shirts to is called Glad’s House (please check out their site) and they help young people living on the streets of Mombasa. For many of the children who visit Glad’s House, their Lionheart Tee will be the first new item of clothing they have ever owned. Hable are making it easy for you to start supporting their great work too; we are pledging to donate a T-shirt for everyone who signs up to receive our newsletter before the end of May. If you don’t enjoy our newsletter, you can always unsubscribe later – but your donation will already be on its way to Kenya 🙂 If you would like to buy a Lionheart T-shirt for your child please go to the Facebook page and send Leo a message!